It is strongly recommended students seek academic advising from AACE, the student service center in your college, and the department for advising in your major, and any support programs in which you may be participating. Advising in your major: Department advisors and student service centers in your college can help you stay on course to degree completion. Contact the service center for your college or your academic advisor in your department for assistance. AACE is a one-stop center for academic advising, career education and major exploration. We help you understand and complete course requirements, and help you to clarify and attain career goals. A Guide for New Transfer Students, workshops, career fairs, a jobs database, and other services are provided. CBE is home to four departments: Accounting and Finance, Economics, Management, and Marketing and Entrepreneurship. Visit the CBE Student Success and Service Center to find advising for your major. CEAS offers degrees in Hospitality, Recreation and Tourism, and Kinesiology. Visit the CEAS Student Service Center in PE 130 for advising in your major. CLASS includes many departments in the humanities, arts and social sciences. Visit the CLASS Student Service Center web site for advising in your major. Visit the CSCI Student Service Center or your major department for advising in the sciences, mathematics, engineering, and nursing fields of study. Learn more about these programs at the Student Equity and Success web site. The Educational Opportunity Program (EOP) provides advising for California students with economically and educationally disadvantaged backgrounds. 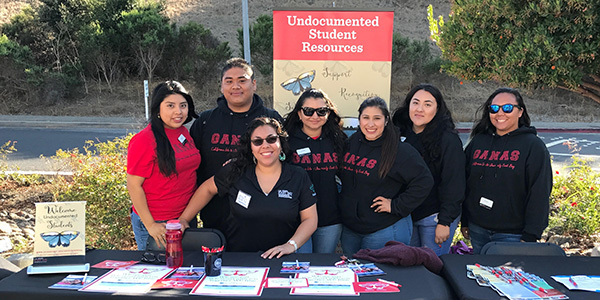 EOP serves qualifying students who have a history of low income, need academic support services, and demonstrate the potential to succeed at Cal State East Bay. GANAS (Gaining Access ‘N Academic Success) aims to smooth the transition process for community college transfer students and to increase the baccalaureate degree attainment of program participants. Students engage in a one-year cohort experience paired with intensive counseling and mentoring. GANAS provides a supportive environment that focuses on Latina/o and multicultural content. The Renaissance Scholars Program provides a variety of educational and support services for former foster youth attending Cal State East Bay. The program aims to increase educational opportunities for former foster youth; improve the retention and graduation rates of program participants; and to create a supportive environment that encourages academic success. The Sankofa Scholars Program is an innovative access and retention program that aims to smooth the process of transition from community college, and to increase the number of students earning their Bachelor's degree. Sankofa is open to all students and provides a supportive learning environment that focuses on African American and multicultural content. Veteran Student Services provides wraparound student support services to all Cal State East Bay veteran students. Program services are organized around two key services: one-on-one holistic academic counseling, and processing educational benefits and benefits coaching. The program offers peer mentoring, referrals to other departments and external agencies and opportunities for networking and building a community of veteran students. Veteran Student Services works closely with the Veteran Student Organization (VSO) to promote the needs of veteran students in the university community. The following offices provide academic support, in addition to medical care, counseling and psychological services, health and wellness services, accessibility services, and student conduct administration for students. Accessibility Services provides academic accommodations to qualified students with disabilities. Our counselors determine accommodations on an individual basis after reviewing current professional documentation and meeting with the individual. We inform and collaborate with faculty and staff to ensure successful implementation of accommodations and to increase the level of access and inclusion of all individuals on campus. The College Link Program is designed “to help students who have been diagnosed with Autism Spectrum Disorder to transition and succeed in the higher education environment.” We help students to develop their individual strengths to assist their academic and social success. The Assistive Technology Services Office (ATSO) provides students with disabilities the technological resources necessary to access instructional content. Visit the web site to learn more about how to apply for Accessibility Services. The PACE Program is designed to support working adult, transfer students to complete their bachelor's degree. Two of the main benefits of being a PACE student are reserved seating in major courses during the first enrollment period each quarter and intensive academic advising. PACE is currently admitting new transfer students majoring in Liberal Studies or Human Development. The Recreation and Wellness Center (RAW) programs focus on healthy lifestyle choices. The 54,000 square foot facility includes a 2-story fitness center, equipment rentals, locker rooms, wellness center, and gymnasium with indoor track. Services include fitness classes, personal trainers, intramural sports leagues, and open recreation tournaments. Wellness programs, interactive workshops and massage therapy are additional services offered. The RAW offers student internships and jobs to gain experience, leadership and professional development. The Sophomore Transition Enrichment Program (STEP) aims to support second year students' retention and academic success by providing academic counseling, peer mentoring, academic tutoring services, and opportunities to engage with on and off campus programs. If you are a sophomore, STEP is a program aimed at supporting you. The Student Center for Academic Achievement (SCAA) offers free tutoring for math, writing and statistics, Writing Skills Test Preparation, Online Writing Lab, e-tutoring, academic workshops. Visit the SCAA web site to see all upcoming workshops and for appointment signups. Student Health and Counseling Services (SHCS) is a fully accredited outpatient clinic staffed by Board Certified Physicians, and licensed Nurse Practitioners, Nurses, and Counselors. Student Health and Counseling Services offers basic medical care for most illnesses and injuries and various elective services. You must be a regularly enrolled student, non-regularly enrolled student, or transition health care participant to be eligible to use Student Health and Counseling Services. Contact: (510) 885-3735. Emergencies: In a medical or psychiatric emergency, please call 9-1-1 On campus contact the University Police Department (UPD) at (510) 885-3791 Or go to the nearest emergency room. Career development and employment assistance services are provided to students by AACE, the Academic Advising and Career Education office. AACE counselors guide you in understanding and completing all General Education and graduation requirements. Obtain assistance to clarify and attain your career goals. Staff can assist you in exploring fields of study, developing your skills and helping you prepare to obtain employment with resumes, cover letters, interview practice and more. Meet prospective employers on campus at Career and Internship fairs. Look for jobs and internships in the Pioneer Jobs portal. Student employment and internship opportunities are offered by a variety of employers to Cal State East Bay students. Visit the AACE web site to find jobs and internships by signing into the Pioneer Jobs portal to find jobs and internships. Telephone assistance is available M - Th 10:00 a.m. - 3:00 p.m.
No phone service on Fridays, please call back on Monday or e-mail finaid@csueastbay.edu. Visit the Enrollment Information Center for an appointment. Enrollment Information Center Open M - Th 8:30 a.m. – 5:30 p.m., Fridays 10:00 a.m. - 5:00 p.m.
M - Th 8:00 a.m. - 6:00 p.m. and Fridays 8:00 a.m. - 5:00 p.m. Located on the First floor of the Student Services and Administration Building on the Hayward Campus. Scholarships Apply online year round with a single application in the Pioneer Scholarships portal.